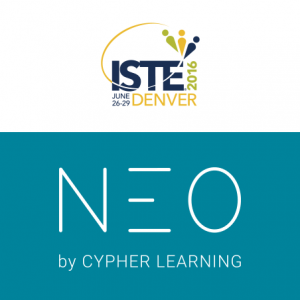 NEO, the simple, powerful LMS for schools and universities, will be exhibiting ISTE 2016 in Denver, Colorado between June 27-June 29. NEO, the simple, powerful LMS for schools and universities, will be exhibiting at ISTE 2016 in Denver, CO between June 27-29. The ISTE Conference & Expo attracts upwards of 16,000 attendees and industry representatives, including teachers, technology coordinators, administrators, library media specialists, teacher educators and policy makers. Attendees enjoy world-class keynotes, hundreds of sessions in a variety of formats and a massive expo hall. NEO is a world class, award winning LMS for use by schools and universities. The platform is known for its easy-to-use and beautiful user interface, comprehensive set of innovative features, and pricing that provides great value for money. With this platform it’s simple to create great classes that students will enjoy anytime, everywhere. NEO is a product of CYPHER LEARNING, a company that specializes in providing e-learning platforms for organizations around the world. CYPHER LEARNING provides a similar LMS for use by businesses called MATRIX. This year NEO has prepared a lot of exciting news, unveiling of upcoming features, and sweet treats. Attendants can visit our product in the expo hall at booth #2756 where the NEO team will be ready to provide live demos and answer any questions regarding educational technology, e-learning for schools and universities, and 21st century learning. Attendants will also get the chance to chat with the company CEO Graham Glass and exchange ideas or learn more. Graham will also be available for interviews for the extent of the event. To schedule an interview or other press related inquiries, please contact us. CYPHER LEARNING is an e-learning company based in San Francisco that has two products: NEO an LMS for schools and universities and MATRIX, an LMS for businesses. These two products are used by over 20,000 organizations, support 40+ languages, have millions of users, and have won several awards.